Are we going to play tomorrow? I'm supposed to be doing HG, right? Ok, well, if we play, it won't be HG exactly. I had a long and rough week, and just wasn't up for trying to learn a new rules system. But, I am willing to run the same kind of scenario I talked about using my own system. I have it written up, and I have copies of the core rules printed out. I will also bring SpyCraft in case the EGO game doesn't work out. Also, the security gates are working now, so give me a call when you get here. I left my phone there, so I will be up tomorrow (later today) to get it. Yep, I'll be in gone. The weekend after should be ok though. Oh yeah. I may have my Tyranids by then though. Well, do ya? Enough for a 500 point force? Cuz I gots da Orks! Yeah, I think I can pull that off. I had them all in my mail box when I got home. Sure. Give me a call on my home line. My cell phone charger is in a Holiday Inn in Eureka. Fear the WAAAGH!! of Gortek!!!! Cthulhu wrote: Fear the Fetus Tyrant! Are we doing anything tomorrow? That's cool, I woke up really late this morning and forgot to pack up my 40k Stuff. Anyone free on Wednesday? Heh. I totally forgot about this. Wednesday should work for me. In ancient times, the Forgaard Mountains were home to powerful dragons. These dragons were few in number, but they were the masters of all who dwelt there. Especially the clans of barbarians driven into the mountains by crusading knights of the Talos Empire. These barbaric people had made pacts with the dragons. Each clan served a particular dragon, working, gathering, and even fighting when needed. In exchange, the clans were kept safe from the knights. But then came the Dragon War. The knights sought to break the power of the Highland Dragons by recruiting the help of their own dragons. They stole the eggs of any they could find, and raised the hatchlings as slave-mounts. When the knights had sufficient strength, they attacked without mercy. In the end, a single Highland Dragon remained. Deep in his fortified cave, he performed a ritual that would make him immortal and invulnerable. This dragon, Kerivaxx, emerged and slew any dragons he could find, driving the knights back to the lowland plains. But whenever he slew another dragon, he would take itâ€™s corpse back to his lair. What he did was not readily known by his servile clan of humans. But it was soon revealed that his rituals would steal the â€œessenceâ€ from the dragon, storing it in a totem that he had created, thus sustaining his own power. But the further he ranged from his totem, the less powerful he became. And soon, he was unable to find any dragons within his realm. So, Kerivaxx devised a plan. Once every generation, he would choose a warrior from his servants, and imbue that warrior with some of his power. 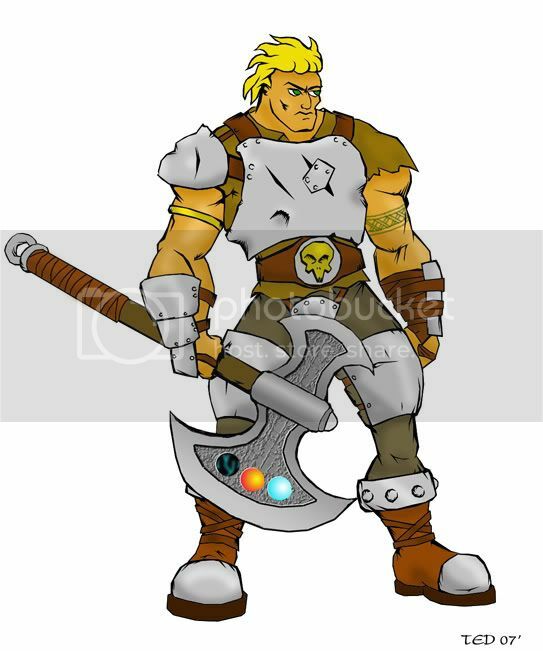 In exchange, this warrior would be tasked with bringing Kerivaxx a Dragonstone, a large gem imbued with the essence of a recently slain dragon. Should the warrior fail to do so before he met his death, his soul would be consumed by the link with Kerivaxx. And another would have to be chosen. But if he were successful, he would retain his powers, and his family would be spared from the task for five generations. 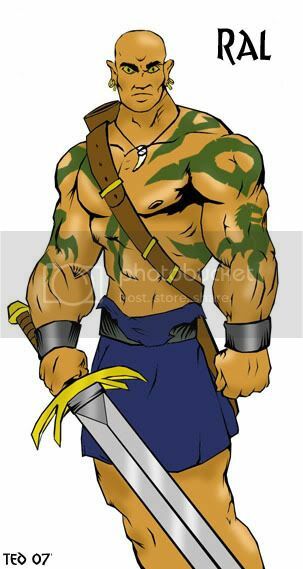 The Dragon Warrior is easily recognizable for the â€œtattoosâ€ that cover his body, and the dead, reptilian eyes. He is often feared, and carries a reputation wherever he goes. Few people within a thousand leagues have not heard of him. Many believe he is the same man, and is immortal. Most believe his power comes from a pact with a demon. In the past, some Dragon Warriors have made no effort to dispel these rumors, thus fueling their spread. Ral had not wanted to be the Dragon Warrior for his generation. While the power was tempting, the responsibility and potential consequences were more than he felt he could handle. But Kerivaxx thought otherwise. He had chosen Ral, for whatever reason, and now the man was burdened with the task of slaying a dragon and bringing Kerivaxx a Dragonstone. Korel had coveted the power. He had petitioned Kerivaxx himself, but had been refused. The dragon knew that the manâ€™s ambition would all the more dangerous should he have the power of a Dragon Warrior. 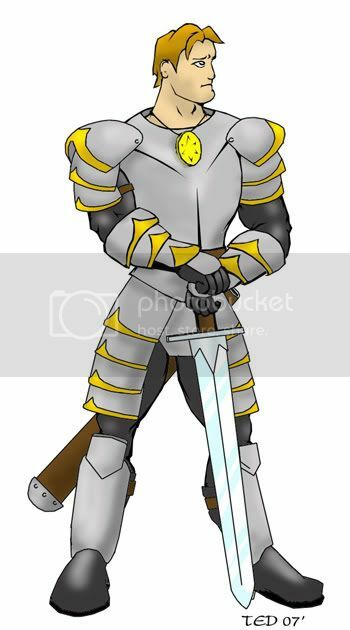 Korel resented Ral, and swore to foil his attempt to bring home a Dragonstone, and thus prove to Kerivaxx that he was stronger, and a better choice to be the Dragon Warrior. 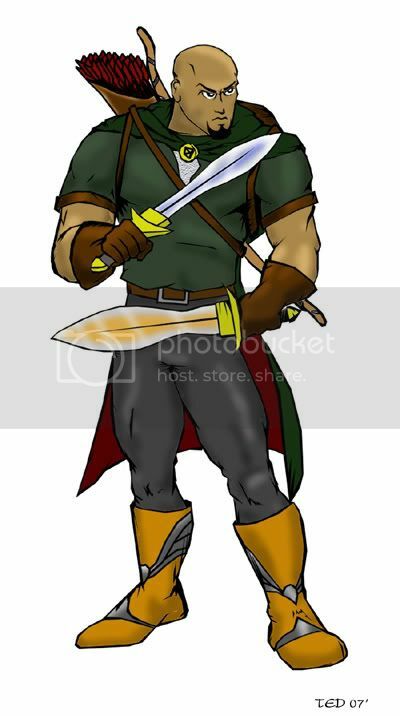 Ralâ€™s appearance is typical of a Dragon Warrior. He is massive, yet lean and lithe. The ritual which infuses the Dragonstone into his body causes several changes. Most notable are the markings that cover his body from head to waist. His head is shaved, revealing the markings there as well. Because the magical properties of the Dragonstone make him highly resistant to injury, Ral wears no armor. And like all of the men of his clan, he has an extreme tolerance for cold, and thus rarely wears more than hide boots and the traditional Kilt of his people. Across his back is a massive greatsword, and he carries all he owns in a small pack on his belt, preferring to live off the land when he can. But his most striking feature is his eyes. They are larger than a normal manâ€™s and completely black. This gives him a menacing look, which, when combined with his naturally intense stare, causes people to be unnerved when talking to Ral. Ral is very stoic and laconic, being a man of few words. He will often say nothing when confronted verbally, unless he is absolutely sure of what he wants to say. In spite of the power and burden of being a Dragon Warrior, Ral is actually quite personable when one takes the time to look past his appearance and reputation. Honorable to a fault, Ral will defend friends and those weaker than himself to any end. Like most Highland men, Ral is fond of strong drink, and can carouse with the best of them. In battle, he is completely fearless. He will readily attack any opponent with a berserker fury. Are we still on for 40K tonight? I may show up for a little bit, just to watch. I have last-minute preparations for Michele's arrival tomorrow. Ok, inked and colored, and redesigned the tattoos. We up for this weekend? If so, I thought maybe we could catch '300' before gaming. Cool. I'm up for both. Ok, so pick me up at 11:00 at my house, Richard? Richard's D&D game tomorrow? I'll explain why I think we should do that one. Wow, that's awesome. I love the detail in that. 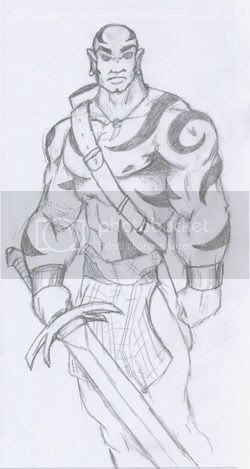 I have a Deviant Art page, and I offer commissioned drawings. This is John's character, by the way. If you can believe that. Btw, John, what screen resolution do you use? I can make you a wallpaper. Richard has to work Saturday morning again, so we should be there between 2:30 and 3:00. Ok, first off, John expressed needing to postpone until Sunday, due to his dad's birthday. I'm cool with that. Richard? Images are blocked at work, so I couldn't really comment yet. The pics are cool, and If you want to do Pierre as a woman, go for it. I'm interested to see how it comes out!